When I was in cooking school I learned how to make zabaglione (zah-buh-yoh-nee), a fancy-sounding, Italian dessert that, because of its simplicity and versatility, became one of my dinner party staples. There are only three ingredients needed to make it: egg yolks, sugar and wine (four, if you count a strong arm!). Zabaglione is a type of custard served all over Italy but its origins are in Piedmont, home of the prized white truffle, hazelnuts, and Barolo wine. In this region of northern Italy zabaglione is often served spooned over hazelnut cake with a glass of the locally produced Moscato d’Asti, a highly fragrant, sweet wine with a delicate effervescence and flavors of nectarine, honey and peach. Moscato Bianco grapes grown on the Piemontese hillsides surrounding the town of Asti are used to make Moscato d’Asti. 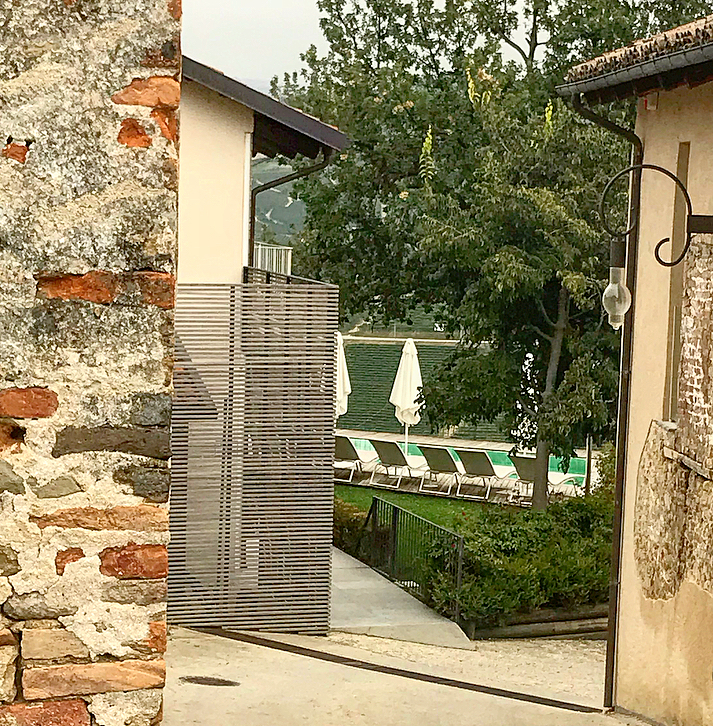 On a recent press trip to Piedmont, I spent an incredible evening at the boutique hotel Palas Cerequio. 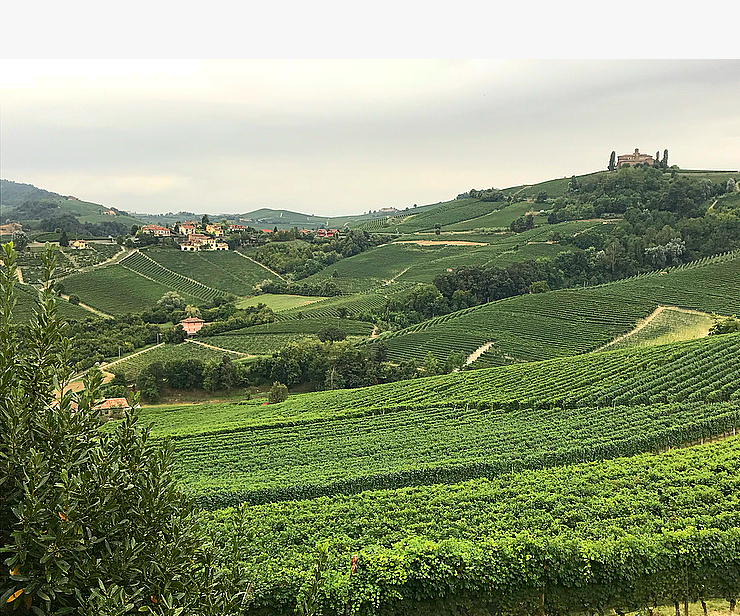 This chic resort, owned by renowned Barolo winemaker Michele Chiarlo, includes a small restaurant that serves traditional dishes in a peaceful atmosphere with views of the surrounding hillside vineyards. 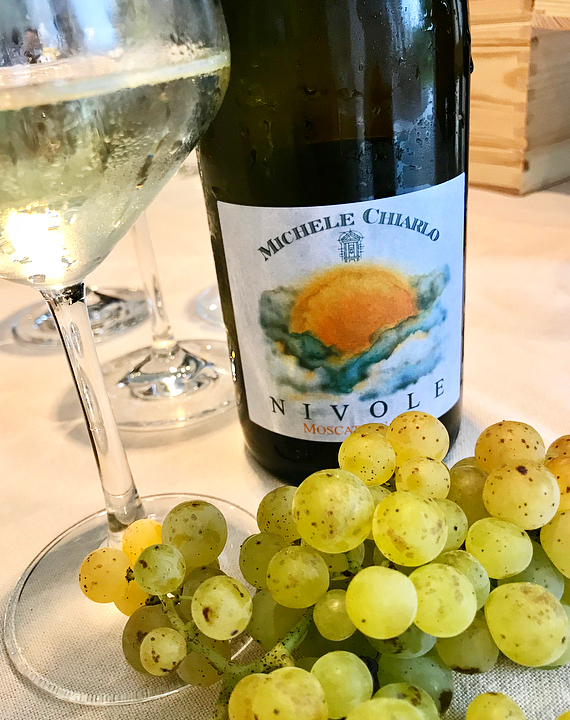 In addition to producing red wines, Michele Chiarlo makes a Moscasto d’Asti called Nivole, named after the word for clouds, an homage to the wine’s delicate finesse. Chef making a perfect zabaglione. Notice the spectacular views in the background. Before dinner, the chef showed us the proper way to make zabaglione. The key to making a good one is to place the bowl of eggs, sugar and wine over a gently simmering pan of water and to whisk the mixture vigorously the whole time (I warned you — you need strong arm muscles!). 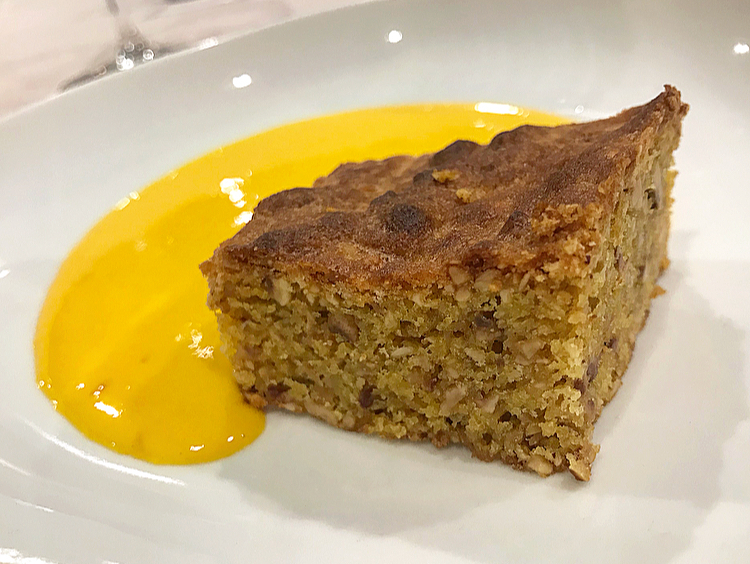 It was no surprise that the chef used Moscato d’Asti Nivole to make the zabaglione and, later in the evening, we were served a slice of hazelnut cake with the creamy custard and a glass of — yes, you guessed it — Moscato d’Asti. As they say in Italy, Perfetto! Note: My trip to Piedmont was sponsored by the Consorzio dell’Asti D.O.C.G. Find out more: Three Reasons Moscato d’Asti Should Be On Your Holiday Table. The end result. A perfect finale to an amazing meal. Note: the egg yolks in Piedmont are dark yellow. Usually, in the U.S., zabaglione is pale yellow. 1) Put egg yolks and sugar into a large nonreactive glass bowl. Whisk together until the mixture is creamy and the sugar has dissolved. 2) Set bowl over a medium-sized pot of gently simmering water (the bowl should be at least 2 inches above water) and vigorously whisk eggs and sugar together for a few minutes. Gradually add wine, little by little, whisking constantly. 3) Continue whisking until mixture is light and foamy, almost tripled in volume, and holds soft peaks, about 10 minutes. (Do not let the egg mixture get too hot or it may coagulate and be ruined). The sauce is ready when it forms soft peaks. 4) Remove from heat and serve immediately, spooned over cake, pastry or fresh fruit. It can also be folded into whipped cream and place in the freezer for frozen custard. Note: you can put it in the refrigerator for a few hours and serve cold or reheated. Stunning vineyard views from Palas Cerequio. Sneaking a peek at the palas Cerequio pool! The doors to the charming rooms are adorned with rose bushes.